The latest data shows euro zone unemployment was 12.1% in November. The U.S. unemployment rate was 7% in the same month. 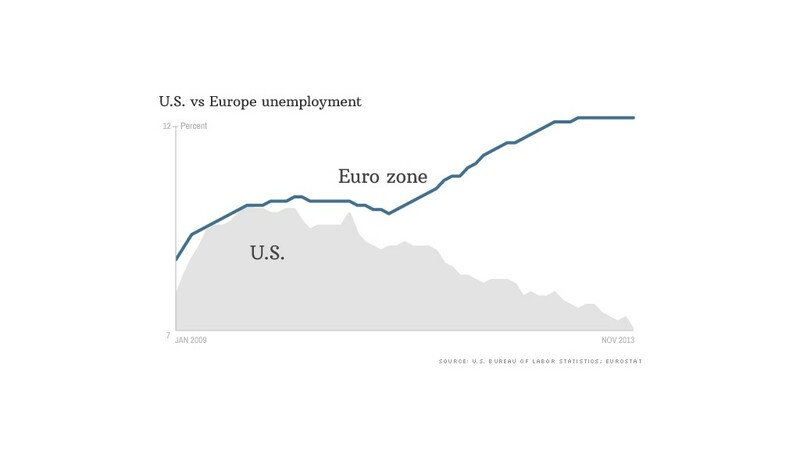 New reports out of the U.S. and Europe Wednesday show a stark divergence between unemployment trends in America and the euro zone. Unemployment in the the 17-member euro zone region was stuck at 12.1% in November, according to the latest Eurostat figures -- it hasn't budged from this level since April. Meanwhile, U.S. unemployment has been slowly and steadily declining, with unemployment at 7% in the same month. On Wednesday, payroll processor ADP reported the U.S. added 238,000 private-sector jobs in December, a significant jump that points to continued improvement in the nation's job market. Related: 2013 ended with strong job gains in the U.S.
Europe is still struggling to recover from a financial crisis and sovereign debt debacle that caused unemployment to surge and consumer confidence to plummet. While the picture is mixed -- with Germany's economy remaining buoyant -- other nations such as France and Spain are still riddled with economic problems. In Italy, the latest unemployment rate of 12.7% is the highest since record-keeping began in 1977. Related: Want to keep your job? Rent, don't buy! But there's growing hope in other European countries that the worst is behind them. Ireland recently emerged from its bailout program, providing a rare piece of good news for European policymakers. In the U.K., unemployment is declining and the economy has been rebounding. After teetering on the brink of a triple-dip recession earlier in 2013, a surge in consumer spending and rising house prices led to a dramatic turnaround.